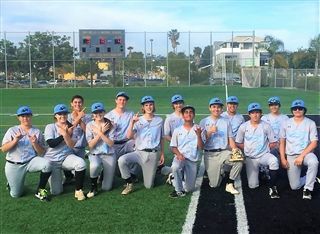 After starting its inaugural season, the varsity baseball team notched its first two wins in Ocean League play against Army Navy Academy! On April 24 the team won 4-3 in extra innings. Three freshman pitchers (starter Grace Li, reliever Abhi Patwari and closer Owen Beim) gave up only two walks over eight innings. The defense played virtually error-free and the offense contributed up and down the line-up, highlighted by three hits from sophomore Max Olafsson. In their second game against Army Navy, the Firebirds notched a dominant 7-1 win. The offense had a great game, with five different players crossing home plate. The pitching staff impressed again, allowing only five hits while recording five strikeouts. What a great week for baseball!